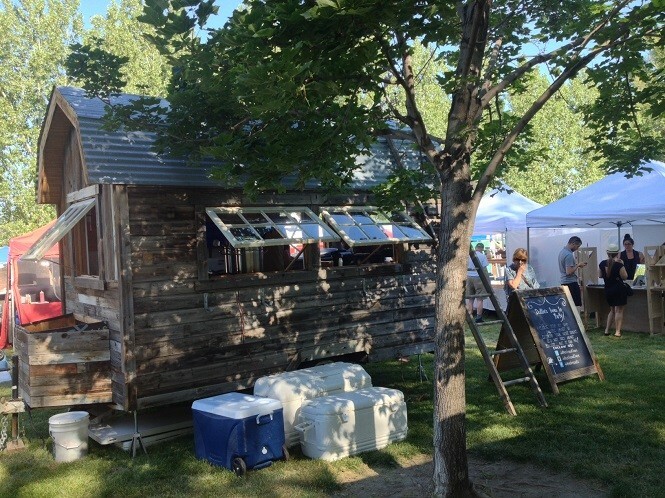 Spending Sunday morning at the Wasatch Front Farmers’ Market at Wheeler Farm is one of our favorite summer rituals. My husband and I stroll through historic Wheeler Farm drinking coffee, enjoying the old buildings, and saying hello to the farm animals. Then we get down to business - shopping for produce from local farms and other local goodies. Since 2011, the market has expanded with more unique food offerings. This year we’ve discovered a few tasty additions to the lineup. Dottie's Biscuit Barn is an actual wooden barn, complete with framed windows, and decorated with homey accents like mason jar lights, a weather vane and chalkboard menu boards. This charming pint-sized cabin serves flavorful comfort food. You’ll find everyone from old-timers to Farmers Market fashionistas in line for Biscuits & Gravy ($8), made with the fluffiest, melt-in-your mouth biscuits drenched in savory mushroom or sausage gravy topped with a fried egg from Clifford Farm. If you’re looking for something sweet, look no further than a piece of homemade pie. Options change from week to week, and fried chicken often makes an appearance. You can pick up a cute t-shirt with their motto “Sop it up with a biscuit” for $15. Falafel House serves freshly made falafel with all the accoutrements. Perfectly crunchy and moist inside, these falafel are some of the best I’ve tried. Seven falafel with tahini sauce, served with tabouli or hummus (I’ve seen both options),a green salad and tart pickled veggies, The Falafel Plate ($7) makes a light and satisfying meal. It’s also one of the better deals at the market since it comes with a soda or bottled water. Falafel House will be at the market every other week, so when you see them, be sure to get your falafel fix. I remember seeing Cup & Cardigan, a local coffee roaster, at the market before, but it wasn’t until I saw a wooden sign offering “Crumpets and Cold Brew” that I decided to visit. Crumpets are the fancy, better tasting cousin of the English Muffin. Made on a griddle, they have the same nooks and crannies as their baked relative, perfect to soak up butter and jam. Served with a pat of butter and homemade jam (Options include Strawberry Basil and Blackberry Merlot. They are both delicious.) At $3.50 for two, it’s a reasonable indulgence. Paired with a cold brewed coffee, it’s a lovely breakfast. Wasatch Front Farmers Market is held every Sunday at Wheeler Farm from 9:00 am - 2:00 pm and located at 6351 South 900 East. On Saturday, you can find them at Thanksgiving Point and Gardner Village.